I know it’s cold outside but we are halfway through winter’s darkness. The days continue to lengthen promising us the warmth and new life of spring. February 2nd marks the midpoint of winter and it is recognized and celebrated in many traditions. The Catholic church celebrates this day as Candlemas. It is said to the be the day Jesus was presented at the temple. It also is known as the Feast of the Purification of the Blessed Virgin Mary. The law of the time stated that new mothers went through purification by blood after birth and were not clean until after 40 days. Candlemas is celebrated as the ending of the Christmas season. The Feast celebration includes the blessing and lighting of candles that are given to parishioners to symbolize the Light of Christ entering the temple and our world. But a similar celebration occurred at this time of year before Christ was born. The celebration of the Celtic sun goddess Brighid. The pagan celebration on February 2nd is called Imbolc. Like Candlemas, it is a celebration of light and purification. It is the time when the life began to stir underground again, like a quickening in the womb. Seeds that have laid dormant are enlivened with the growing light, making ready to shoot out of the ground come spring. This is a time where the energy of the earth is beginning to make that shift. The element of fire is on the rise as the days grow longer. This is an excellent time to begin to take what we have learned in winter’s darkness and put our energies into what we wish to grow in the upcoming spring. We have had the time to take stock and discern where our energy is best directed to support our upcoming growth. 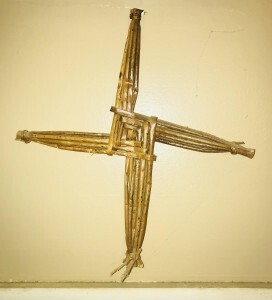 Traditionally the day before Imbolc is a time to do some spring cleaning so we can purify our homes. We can still follow this rhythm, sprucing up our homes and opening the windows to let light and fresh air inside. (Briefly, if it is freezing of course!) It is an excellent time to take a ritual bath with incense and a purifying intent. Or, if there is not a tub available, head to a stream and commune with nature. Then, on Imbolc, bring in the light. Light candles and keep clear intentions. Perhaps light a candle for a deity that can help you bring your intentions to life. Take time to sit in devotion to the fire knowing you carry the same fire within you. Hold the vision of what you wish to manifest and let the firelight the path before you. It doesn’t have to be formal. But if you feel moved by this time between seasons, acknowledge the quickening in your own soul at this time. Honor the fire that enlivens you and nourish it in some small personal way. Your fire is your light and this world needs you to shine. Blessed Be!